||||| HANDCAST FROM ANTIQUES AND VINTAGE PIECES in sterling silver and solid bronze then antiqued to restore original patina. We take great delight in searching out these wonderful pieces in our travels through European and Latin American antique shops and flea markets - items that are impossible to find in the current market. ||||| GIVING THEM NEW LIFE: These old treasures are being given new life that not only brings the past into todays world but they remind us of our 2000 year old history. They remind us of those who have gone before us, praying on these itemns and keeping the faith alive for each new generation. ||||| DO THEY MAKE A DIFFERENCE? 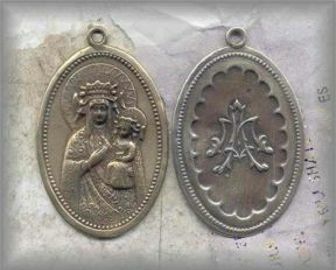 What makes us very happy is to hear how these pieces are making such a difference in the rosaries people are making - that they actually sell the piece. ||||| 23 PRINTABLE PARTS CATALOGS: All items in the SUPPLIES section of the Rosary Workshop are in printable catalog form for your convenience (no paper catalog available). Return to RosaryWorkshop.com (link at bottom of this page) to access this feature. Always check for current date in upper left hand corner so you will have all items available. ||||| UNABLE TO FILL ORDERS UNDER $25: Most suppliers require a minimum of $50 - $100 per order for these two reason: 1. HIGH SHIPPING: (Shipping can run higher than the item itself.) 2. BANK FEES ON CHARGES: We cannot change this but will honor any small orders through PayPal or mail order USPS. ||||| PARTS ORDERS DISCOUNTS: Orders over $100 receive a 10% discount, over $300 no shipping/handling charge + 10% discount! Unfortunately we do not have wholesale discounts on parts as we do not cast in bulk. ||||| BE SURE TO VISIT OUR MAIN SITE (rosaryworkshop.com) to see the ROSARY MUSEUM, HISTORY OF THE ROSARY (Journaling the Bead), PRAYERS, SERVICES (how to make a rosary) and many other interesting things. To return to the cart, simply click on TO ORDER on any product in MUSEUM STORE. ||||| TO IDENTIFY ITEMS BELOW DRAW ARROW (cursor) slowly over image and title will appear. To read more about item, for pricing or to order click image.